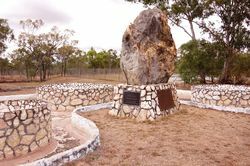 A monument marks the official opening of the Open Cut Treatment Plant by Queensland Wolfram Pty Ltd and pays tribute to the pioneers of Mt Carbine and those who established the mining project. 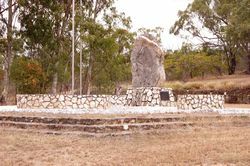 After the collapse of the world`s wolframite markets in 1919, Mount Carbine became practically depopulated. In 1968, R.B. Mining purchased the leases and in 1971 commenced Stage 1 of the treatment plant. In late 1971 an initial settlement of 60 men was built. In 1976, Queensland Wolfram Pty Ltd was formed to buy the mining leases and existing facilities at Mt. Carbine from R.B. Mining. A large increase in housing, a caravan park, messing facilities, a shop and many and varied recreational facilities were provided for the miners and their families by the Mining Co. The population of Mount Carbine and district grew to about 400. However, after enjoying some good years, Wolfram prices started to fall from 1980. By November 1986, there were few options left and the mine was placed on "care and maintenance" until February 1993, when Poseidon Ltd sold all the mining plant and equipment, and the Mining Village at Public Auction.